We were very excited to finally launch this site. The owner, James Serdechny a former Sennheiser Applications Engineer, musician and long-time audiophile designs custom headphone cables. 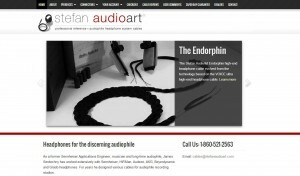 After designing cables for audiophile recording studios started his own company to developed custom audiophile and high-end cables for headphone systems. Site was developed in WordPress using Woocommerce for the shopping cart. Over 100 different products with numerous variations were imported. It was easy to add special discount coupons as well as special shipping discounts.